Despite an increasing international interest to co-produce films in Bhutan, the Bhutanese Film Industry is not able to work together with international investors due to the absence of a co-production guideline in the country. However, once the National Film Commission is set up, the commission together with relevant agencies will start working on developing a co-production guideline. A co-production is a joint venture between two or more different production companies for the purpose of film production. The film industry in Bhutan boomed within a short span of time. But, most of the films produced in the country cater to the local audience. With Bhutan gaining international interest and popularity because of its brand, locations and sceneries, attracting foreign productions might generate inspiration and income for both the film industry and the government. For this, the film industry requires applicable rules and regulations or guidelines to manage international developments and investments. “Once the co-production takes place the biggest advantage we have is we don’t have worry about marketing our films. The co-production companies will invest in Bhutan and at the same time a lot of job opportunities would be created,” Karma Tshering, the President of Film Association of Bhutan (FAB), said. The obvious benefit of co-production is the size of the target audience. For a country like Bhutan, films can be the best way to show its culture, people and society to the world through such joint venture of co-production. The Korean International Cooperation Agency (KOICA) is going to guide and provide support to the proposed National Film Commission in drafting the co-production guidelines and other filming regulations for Bhutan. “I think you have a very big opportunity because it is so small now. So I feel there is a blue ocean and not so many people know about Bhutanese culture. So by improving films, you can show the world about how wonderful Bhutanese culture is,” Jonathan H.Kim, a Film Producer from South Korea, said. 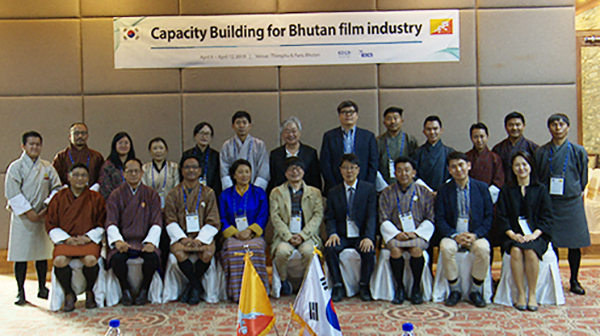 KOICA for the first time launched a country focused fellowship programme last year to develop the growing Bhutanese film sector in Bhutan.